Here I offer for public review my most keenly-sensed take-away from the Poetry & Poetics of the 1980s Conference. 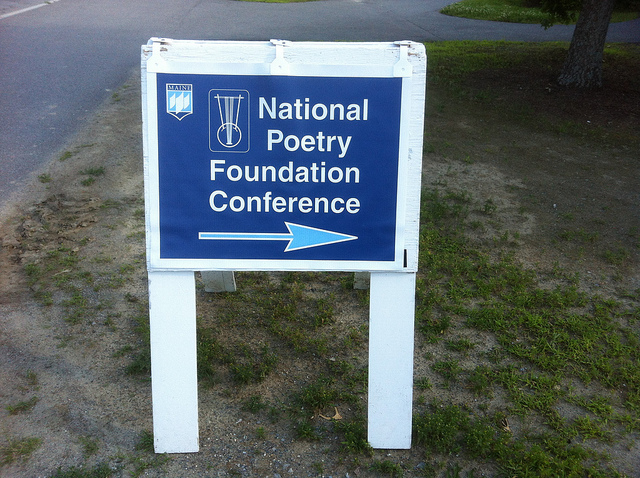 Because I have long been a reader of poetry written in this decade, and though my current scholarly interests expire by the end of the 1970s (I’ve attended both the Poetry of the 1960s and 1970s conference), I went to Orono to revel in poetry and community under summer skies. I didn’t intend to produce a social (or cloud) document – thus, sadly, I have few pictures – but to be present and observe, absorb, and perform. Contributing to a panel and having been invited by Laura Hinton (in early June) to contribute the “Poetry and Performance” event she was organizing, my lead-time to the conference was very intense and productive and, at the other end, for three full conference days I nourished my curiosities and enthusiasms. And here I shamelessly indulge these. Who would want it any other way is free to look for it elsewhere. I arrived on Wednesday eve from Boston with Cathy Wagner as my excellent driving companion and navigator. Amidst our roving conversation we visited upon Irigaray, Denise Riley, conceptual poetry, the institution of academia (she must have recently been thinking about or writing her contribution to the Poetic Labor Project), and creative practice, among other things. I think I gave her a run down of the “geographies of relation” concept I would focus on in our panel (“Feminism in the ‘80s”). We got lost in Auburn, Maine following GPS directions to Food City and happily stumbled upon Axis Natural Foods (I prefer a food village) where I was able to stock up on sustaining wheat-free vittles (having recently discovered my love for Liz Lovely vegan/gluten free cookies). 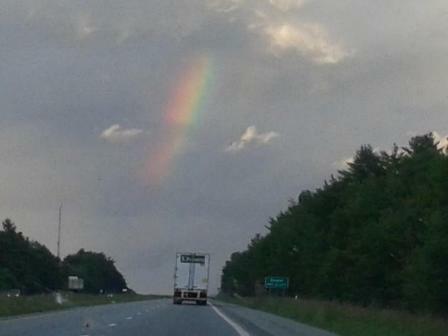 Like others traveling north, we drove under a cloud-smudged rainbow. 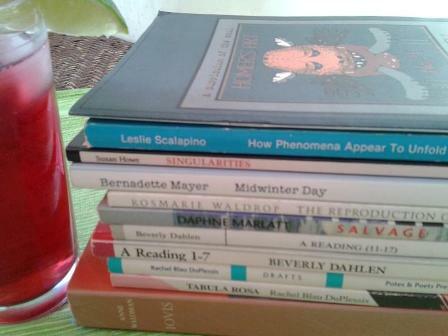 Thursday morning I attended the “Gender and Genre” panel where two poets on my 80s conference reading list (see photo below) – Bernadette Mayer and Rosmarie Waldrop—were featured. Being the first panel of the conference, and given my longstanding interest in what arises and is subverted at the intersection of gender and genre, I was eager to hear what would unfold. Ellen McGrath Smith’s presentation of a history of the framing/taming of the prose poem to reclaim a critical view of its vitality as a space of “writing the feminine” (so to speak), included the panel’s most memorable line: “when we start to talk about uncles, maybe it’s time to drop the lineage metaphor altogether.” I found it interesting that this group of papers (including David Need’s comparison of Bernadette’s Midwinter Day and Fanny Howe’s The Lives of a Spirit as sites of DeCerteauian resistance with particular attention to formal strategies and the quotidian and Ben Gillespie’s analysis, couched in a history of visual aesthetics in poetry, of resistance to the authority of the page as a visual space in Waldrop’s prose poems) dealt with gender and genre as separate categories, rather than as a cross-section of thinking, one as a lens for the other, for instance. Given the way panels get named on such occasions, it’s not fair to hold any of these scholars to account, but this interesting juxtaposition did at the time prompt me to wonder (aloud, as it turns out) if there was reason to revisit this sort of decidedly gendered genre critique (so thoroughly addressed in the work of Rachel Blau DuPlessis and other scholars), if there was more to say. That afternoon, I attended “Post-Generic Writing in the 1980s” with Stephen Fredman, Peter Middleton and Kaplan Harris, whose provocations were excellently placed for Marjorie Perloff, Respondent, in this well-attended panel (to provide a little illustrative seating chart, I sat between Laura Moriarty and Miriam Nichols whilst Pen Creeley and Susan Howe sat in front of me). Marjorie selected her choice spots to prod and produce smoke if not sparks; she began, I believe, with the panel title: “is there a post-generic? of is it just a different genre?” (Given my own confessed prod to the previous panel, I have to marvel at the efficacy of this simple, some would say obvious, strategy). Middleton’s paper came closest to articulating the 1980s as a cultural-political time frame for poetry—and I note this because it seemed underplayed, at least in the variety of panels I attended—looking at correspondences between then-contemporary discourses (medicine/AIDS, finance/US economy) and Lyn Hejinian’s The Cell. The panel as a whole—with Kaplan offering as an entre into his look at San Francisco as a literary-geographical site a passage from Kathy Acker’s early novella The Adult Life of Toulouse Lautrec by Henri Toulouse Lautrec (1978) that prominently features (or deploys) “Ron Silliman” and Fredman’s paced treatment of attenuations of “poet’s prose” in Hejinian, Acker, and Cha—was well-rounded and it was interesting to see scholars one after the other at work in such different critical modes. A little aside here on note-taking in panels. I’m terribly impressed with absorptive audients, those few, usually the more accomplished, who put on a serene face and drink ideas in. Personally, I take a lot of notes, mostly illegible, to swat ideas down onto my brain, if only fleetingly. Cathy Wagner’s “Identificatory Stances and Identificatory Trances: Denise Riley and the Legacy of Her Lyric Argument” made a great case for a historical reading of Riley’s subversion of lyric that, for Cathy, called into question the professed intentions of Conceptual Poetry regarding the disappearance of authorial intentionality these days. I rounded out the panel with a performative reading from several stacks of index cards (I’d meant it to look somewhat like a Tarot reading, and one audience member described it, I later heard, as “ludic,” so that was nice)—a series of questions, observations, and propositions viewing 1980s long poems by women (I primarily referenced Mayer, Waldrop, and Howe but was also thinking, sometimes aloud, about Notley, Berssenbrugge, Scalapino, and Dahlen,) not as discursive disruptions (a la ecriture feminine, Kristeva’s chora, post-structuralist subjectivities, etc.) but as investigations of actual space as a site of female inhabitance, with the text as a “geo-graphy”—a writing of actual spatial relations which are gendered and inform cultural constructions and performances of gender. The discussion following treaded along the mobius strip of woman/writer and raised the issue of the 80s being an era of multiple feminisms. taking these as a context for my thinking and performing. I came to think of my presentation as more of a provocation than an argument. Knowledge, and how one brings this to bear on the spaces she inhabits, is not gender neutral. We are all Susan Howe in some archive; her radical rearrangements and the female presences that emerge were important for me in thinking through what other women poets accomplish in terms of place and writing. 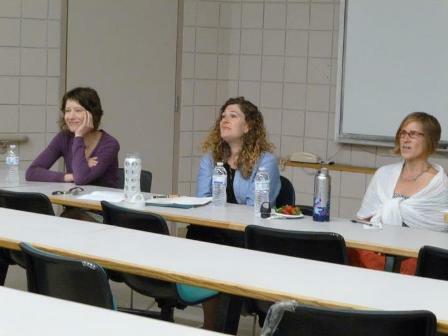 I met up with Aldon Nielsen, Evie Shockley, Cathy Wagner, and Laura Hinton—there’s a photo of me on Aldon’s website bursting with laughter—I don’t remember what about. But we had great fun figuring out how to perform each other’s pieces and, we all agreed, assembled an intriguing program. More on this in a bit. After lunch, in “A Sisterhood of Exploration: The Feminist Project of HOW(ever),” Linda Kinnahan began by passing out issues of the slim “magazine” (talk about gender and genre!) for attendees to peruse. This is living history: the feel of the urgency of assembly, of putting these various texts and visual text side by side in a collage of inquiry in fragments unpressured and gestating—this is what feminism in the 80s, to me, who wasn’t (quite) there, is about. Through an exploratory and collaborative mode of inquiry, HOW(ever) tapped into a broad range of critical and creative works and their cross section. The three papers on this panel offered very different and useful points of access into this important project. Getting to know Kathleen Fraser and HOW(ever) was part and parcel of my introduction to LangPo as a larger avant-garde formation and very important in getting me to Buffalo’s Poetics Program; she/it helped structure a lot of my thinking about feminism and innovation and the small press, and I’m glad to see there is still much more to be explored. Our next stop in the conference proceedings is the cocktail hour preceding the banquet. Picture the variety of people pouring into a somewhat narrow, large-windowed space, lining up for the bar and forming mobile evolving chat-clusters; picture it from above, how it might look like generative cellular activity as participants continue to show up and cluster and circulate and recluster. And flash to the organized pattern of banquet tables with a few cells swaying about in search of a free chair. After the banquet I had the pleasure of walking a stretch to the evening’s keynotes with Meta DuEwa Jones who remembered me from years ago when she’d been interviewed for a position at Buffalo and I was a grad student and we talked about C.S. Giscombe and mapping. I’d seen her give a paper the previous month in San Francisco on a fantastic panel on African-American poetics with Evie Shockley called “Innovative Nostalgia,” where her claim that “what’s nameless can be landscaped or mapped geographically” had encouraged me to consider mapmaking as a cultural practice and poetics as a way of disrupting hegemonic mapping. Keynote Speaker Marjorie Perloff was vibrant as ever as she zoned in on Charles Bernstein’s Contents Dream and Susan Howe’s My Emily Dickinson, looking in particular at the work they accomplish in terms of theory and criticism at the level of language. It was great to hear close readings of passages in both of these seminal works. I had, sadly, to miss most of Kevin Killian’s piece to do tech set-up for the “Poetry and Performance” event, but I took strength from hearing him voice a few paragraphs, from seeing the characteristic flick of his head to shake back his bangs (and from watching the whole talk on youtube right after the conference. Just do it). 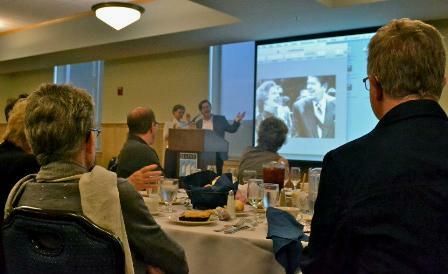 The “Poetry and Performance” event offered a fantastic array of works. 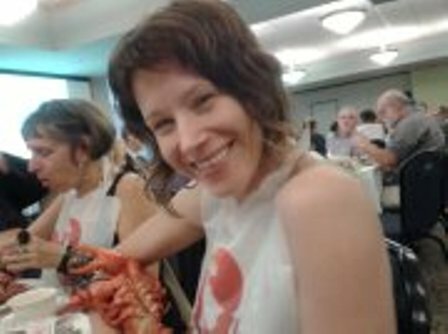 Aldon Nielsen has posted on this on his blog (which includes a copy of the program for the event and he has since updated his blog with many photos laying down a social history of the whole conference) as has Laura Hinton. Part of Laura’s impetus for organizing this event was to represent within the frame of the conference poets pushing at the boundaries of the “poetry reading.” Success. First up was Cathy Wagner, singing and performing poems in several voices; Evie Shockley and Laura Hinton’s pieces similarly bumped out the vocal space of the poetry reading proper. Evie’s reading/singing commenced with her remixed phrase “Those who cannot forget history are destined to remix it” and her poems continue to mix it up, presenting linguistic and sonic clashes that provoke new thought forms (beautifully resonant of Harryette Mullen, I thought; these two I had just seen read at the ALA conference the previous month). Laura’s “Paris in the Springtime” included dance moves (my dance debut). Laura and I donned masks for one piece in which the audio cued us in a series of difficult moves (because fast or moving quickly on vertical/horizontal axes) and looking out at the audience through a mask while performing in this sort of disembodied way was really interesting. Next came my first soundscape piece, a multivocal reading of a page from my recent chapbook American Heritage Syntax, with Aldon, Evie, and, volunteering from the audience, Robin Tremblay-McGaw, together with my own voice presenting a fantastically layered assemblage of sounds (sometimes remixed) from these short poems. A delight for me, personally, to hear this particular articulation of sound forms in time, and the audience thought it was a hoot too. It was a great audience! From then the program went techno, with video, audio, recorded and spoken voice on the part of Laura, Aldon, and myself. Aldon’s recordings of this event will be available at PennSound in the near future, I’m told. This event was of course a favorite of mine since it was, for me, several firsts: my first theatrical performance as a part of Laura’s lovely work; my first multivocal sound collage; my first soundscape-audio/poemtext piece, “Geothermal/Jarditha” (based on recent travels in Iceland); and the debut of “South Fork Palouse River,” an interactive map-poem. This concluded the program, though I soon after read the text of this piece aloud for the audience, since Douglas Rothschild had at this point arrived, having decided to move the Open Mic reading into this space. 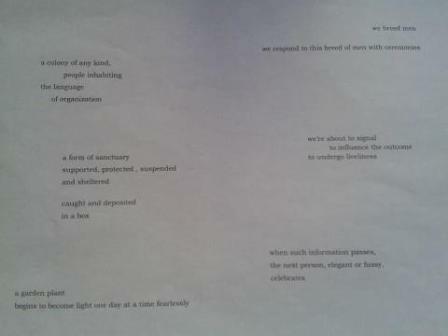 It began with some marvelous found poems by a man whose name I didn’t catch. I was also enjoying the contrast in pace and verbal density from the previous performances. Certainly it is a way of giving the poems “force” without all the muscularity. I suppose I was playing/working with how that space was being constructed, as any conceptual poet would (though I’m not a conceptual poet). After I left, Cathy recited and sang from memory some medieval lyrics. Sorry I missed that. Saturday I rose bright and early for a full day of interesting panels. 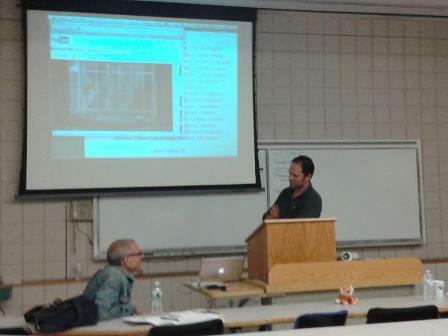 Each included three thought-provoking presentations, and here I offer a selective account with a few highlights: from “Transmission, Tradition, and Change,” Jonathan Skinner’s commentary on Michael McClure’s ecopoetics with a disturbing video of him (McClure) roaring at a caged lion (“grahhr”), here pictured along with Benjamin Friedlander and Stuffed Tiger. I’m still stretching my brain into his (Skinner’s?) proposition to think of the poem as an animal (contrary to Williams’ valorization of the machine); from “Interrogating Agency, Authorship, and Reproduction,” Sara DiMaggio’s theorizing around the pregnant subject in Anne Waldman’s First Baby Poems, proposing a question compelling enough to repeat here with some emphasis: what does poetics have to learn from the pregnant body? ; from “Poetry and the Visual Arts,” Robert Dewhurst (a Buffalo Poetics grad student I look forward to hearing/reading more from) with an analysis of locality/vocality in vernacular speech in Eileen Myles’ debut Fresh Young Voice from the Plains (no doubt whittled out of the more broadly-titled paper “Rimbaud in New York: Expressionist Lyric in the 80s”); from the plenary panel with a long title (“Discrepant Engagements: Long Form and Hybrid Genres in the Writing of Nathanial Mackey, Erica Hunt, Beverly Dahlen, Anne Waldman and Robert Gluck,” with Robin Tremblay-McGaw, Kathy Lou Schultz, Kaplan Harris, Erica Kaufman read by Cathy Wagner, and Rob Halpern read by Kevin Killian), which came late in the day and it’s a shame there was neither time nor energy left for discussion, for these were several great papers that I would have liked to dwell on/in with some specificity. Robin has recently written about this panel (& the conference more generally) on her blog. 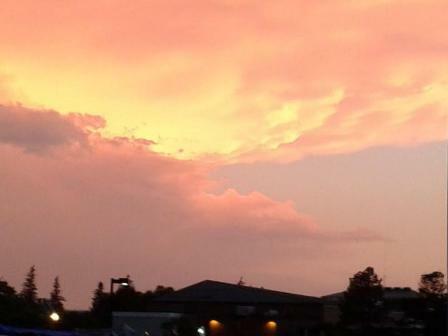 On the way to the evening keynote I was accompanied by an animate beclouded sky. A final round of keynote readings brought Mei-mei Berssenbrugge (who had been the respondent earlier in the day in the Visual Arts panel, at which Laura Hinton had given a grand overview of her artist book collaboration with Richard Tuttle, Hiddenness—a nice primer for Mei-mei’s reading) and Nate Mackey to the stage, along with introducers, respectively, Jennifer Moxley and Aldon Nielsen. The glow and spaciousness of Mei-mei’s words; Nate’s epistolary series, From a Broken Bottle Traces of Perfume Still Emanate, “fugitive texts” Robin Tremblay-McGaw had elaborated on earlier in the day (it’s nice when things come together like that to trace out common pulses and deepen engagement)—it was a fantastic reading. The evening wound up and back down with the open bar and open readings. Again, not being the social documenter and not trying to make myself a part of history, I flitted about taking advantage of these last moments to see what people were up to and what they were all about until the bartenders packed up the bar, whence we—a small crowd then-familiar and now only partly remembered (I won’t list names because there were far more people, maybe a dozen, than those whose names I can remember) packed it on over to the dorm and situated ourselves in the first floor lounge to imbibe in talk and further libations and it was so late that more than one person decided to stay up to catch an early flight or a ride. I, being the driver, bade everyone good night, which made me a little sad, to catch some sleep. I had hoped to have some free time en route back to Boston for a quick detour, and it was disappointing not to, but I’m glad to present to you here the marvelous sculpture of Isabelle Pellisier, which I would like to have experienced face to face. Drove back with Cathy Wagner and Adra Raine, an Orono alum who I heard read an interesting memoir-paper about reading in the 1980s. Another thing to be sorry to have missed. More companionship to be glad to have experienced. Thus concludes My 2012 Orono. Note: Three photos— the conference sign, the Wagner-Bywater-Russo “Feminism” panel, and the shot of Steve Evans and Carla Billitterri from behind Susan Howe and Peter Middleton—were sourced from uncopyrighted public documents. The remaining photos were taken by me. Linda Russo is the author of Mirth (Chax Press) and American Heritage Syntax (Publisher Unknown) and several other chapbooks. Her poems have appeared in ecopoetics, Horse Less Review, Interim, New American Writing, Shearsman, Summer Stock, Tinfish and elsewhere. Her essay “Precious, Rare, and Mundane” is the preface to Joanne Kyger’s About Now: Collected Poems (National Poetry Foundation). You can visit her on Facebook.